Owner of fly-tipped caravan previously reported by Telford Live has been fined, despite not dumping it himself. The man owned up to his part in the dumping of this caravan near Newport and has been issued with fixed penalty notices totaling £700. The caravan which was full of garden rubbish, paving slabs and old tyres was found in Cherrington on Saturday 24 June. 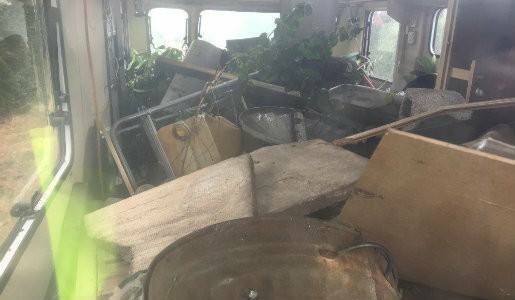 An investigation by a Telford & Wrekin Council Environmental Enforcement Officer traced the owner of the van and its contents to a man in the Black Country who admitted he had had a clear-out and hired someone to dispose of it all. But he didn’t do the necessary checks on the person he paid to get rid of the waste. •£300 for failing in his duty of care by not checking the credentials of the person he hired. “It was a hot day and it was a very messy job rifling through all the rubbish. “I couldn’t get into the caravan because it was so full, so, I had to take out the windows through which I removed the material that was inside. “There were tree stumps that were four feet high and more than a foot in diameter, other garden waste, vehicle parts including a bumper from a 4×4 and an old tyre, slabs, electrical equipment, a gas bottle, magazines and a garden incinerator. “There were things about the caravan and its contents that led to my identifying this man in the Black Country. The caravan had identification markers on all its windows. Its number plate, removed from the back of the van was inside. “There were educational certificates, invoices, warranty paperwork, family photos, and employment, bank and DVLA details. “I also found event tickets, including concert tickets for a Nickelback gig in Manchester last year! Cllr Richard Overton, Telford & Wrekin Council’s Cabinet Member for enforcement said: “Well done to Richard for his detective work. “This should act as a warning to anyone thinking of hiring someone to dispose of their waste. “It’s important, when hiring someone, to check them out. You need to know who they are, what vehicle they will use to take away the waste and where they are taking it to. “Get the details of their waste carrier licence and make sure you get a receipt. This serves as a warning to those people offering and booking ‘skip runs’ via Facebook. What’s more disgraceful – doing this or buying a ticket to a Nickelback gig? Was this van found on the way up from Shawbirch towards Drayton? Should have been fined at least 5000 quid for going to a Nickelback concert.